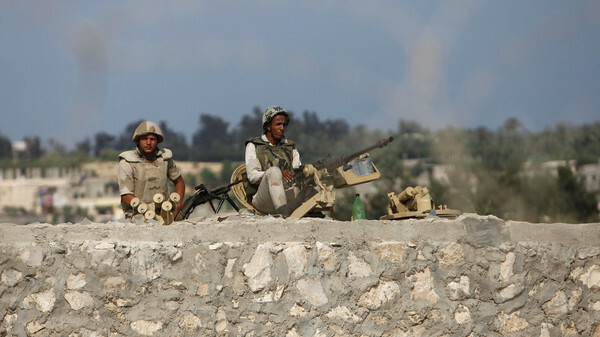 Armed men launched a series of attacks on Sunday on security checkpoints in the North Sinai towns of Sheikh Zuweid and El Arish close to Egypt’s border with Israel and the Gaza Strip. Eleven Egyptian policemen were killed when a roadside bomb blast struck their armored vehicle in the restive Sinai Peninsula on Tuesday, security officials said. Islamist militants have claimed a string of attacks that have killed scores of policemen and soldiers, mostly in north Sinai, since the army overthrew president Mohamed Morsi in July last year. Another four conscripts were wounded in the explosion on a road leading to the town of Rafah bordering the Palestinian Gaza Strip. The military has sought to quell the militants in a massive operation that has killed scores of extremists and netted some of their leaders. The main militant group, Ansar Beit al-Maqdis, has acknowledged in statements the loss of some of its leaders, but has continued to attack both the security forces and Bedouin suspected of collaborating with them.